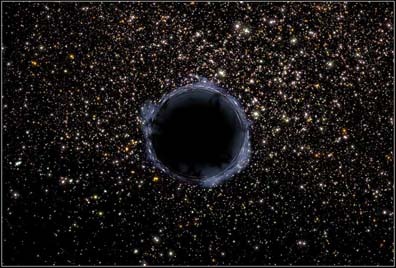 Artist's rendering of a black hole in a globular cluster. Photo courtesy NASA and G. Bacon, Space Telescope Science Institute. SEATTLE -- A study at Ohio State University has uncovered more evidence that black holes form before the galaxies that contain them. The finding could help resolve a long-standing debate, said Marianne Vestergaard, a postdoctoral fellow in astronomy at Ohio State. Vestergaard came to this conclusion when she studied a collection of very energetic, active galaxies known as quasars as they appeared some 12 billion years ago, when the universe was only one billion years old. While the quasars were obviously young -- they contained large stellar nurseries in which new stars were forming -- each also contained a very massive, fully formed black hole. More and more, black holes are being found at the center of galaxies. As the close relationship between black holes and galaxies has emerged, astronomers have debated which of the two came first. One model holds that mass builds up at the center of galaxies, eventually collapsing so black holes can form. Another holds the opposite -- that black holes exist first, and their immense gravity draws gas, dust, and stars together, causing galaxies to form. Looking at this evidence, I have to think that black holes start forming before galaxies do, or form at a much faster rate, or both, Vestergaard said. She described her study January 8 at the American Astronomical Society meeting in Seattle. One year ago, Vestergaard announced that she had developed a new method for estimating the mass of very distant black holes, ones that existed far in the past. The method involves comparing the spectrum of light emitted by the quasars that host the black holes to spectra from quasars existing today. Astronomers consider a galaxy active when it emits much more energy from its nucleus than can be accounted for by its stars alone. This radiation is detected at wavelengths that span from radio waves to X-rays, Vestergaard explained. Quasars are the most energetic of the active galaxies, from which all the energy spills out of a very small region at the center, equal to about one-millionth of the diameter of the total galaxy. It is in these central regions that black holes reside. For this latest study, Vestergaard used her method to examine a special set of distant quasars. Part of her data came from the Sloan Digital Sky Survey, a collaborative project that maps the universe from Apache Point Observatory in New Mexico. She compared the spectra from those quasars to other quasars that are closer to Earth, including ones documented by the Bright Quasar Survey. In the several hundred quasars she studied, a pattern emerged: even the smallest, most quiescent of these active galaxies contained a massive black hole, on the order of 100 million times more massive than our sun. Theoretically, the black holes should have taken a long time to grow that big, if they started out as small seed black holes and grew by accretion alone; yet, their host galaxies showed ample signs of youth, such as intense star formation, copious amounts of molecular gas and significant dust production. This information could help astronomers better understand active galaxies, as well as more typical inactive galaxies such as our own. All these issues are intertwined -- the powering of the central engine of an active galaxy, the forming of black holes, the forming of galaxies, she said. She added that future developments in this area will depend on KRONOS, a satellite proposed to NASA by Bradley Peterson, professor of astronomy at Ohio State, and his partners from around the world. KRONOS will be able to image material spiraling into black holes with a resolution 10,000 times finer than now possible with the Hubble Space Telescope. For instance, how fast do black holes grow? Do they grow only by accumulating matter from around themselves, or do they also need some cataclysmic trigger event, such as when two galaxies collide? We need deep surveys of the universe to answer these questions, Vestergaard said. Other pieces of the puzzle will come from researchers such as Ohio State graduate student Adam Steed, who is working with astronomy professor David Weinberg to model black hole growth. If we could construct a complete model of what happens to a black hole over its lifetime, we could look at real black holes from different points in the past, and see whether our model is consistent, Vestergaard said. That would be really exciting, and we would understand more about what is happening in the universe today. Vestergaard remains optimistic that astronomers can conquer these hurdles in the near future. I never thought we would come to a day in my lifetime when we could measure the mass of such distant black holes, she said. But here we are.